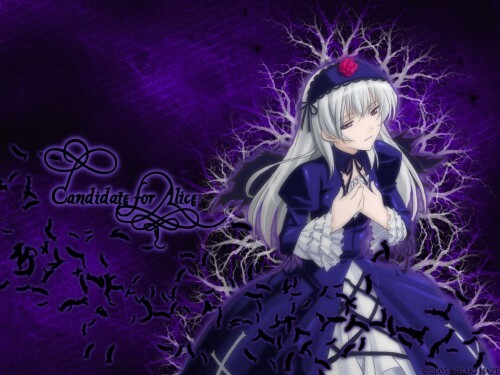 If you've actually seen the anime, you would know what "Candidate for Alice" means, so I wont get into that for spoiler reasons. :) Anyway, hope you all like this one, I personally think I did an ok job, but thats just me. Nice wallie ! I like the effect behind Suigin ! Actually i never seen Suigin this kind of Ekspression ! But so nice to see her other self ! Thx for sharing ! Okay, umm, the scan is a bit grainy and the feathers look weird. They look like flying worms to me. backgorund is okay though. Not my best, i know. the pic was supposed to look as if she was glowing. I think is quite good. As you mention, win some lose some, in this particular case, win the high quality of the background and lose te quality of the main image. However, this is a very good wallpaper. ;). not bad.. but the effects are rather too concentrated into the character.. making the whole other side of the wallie pretty empty..